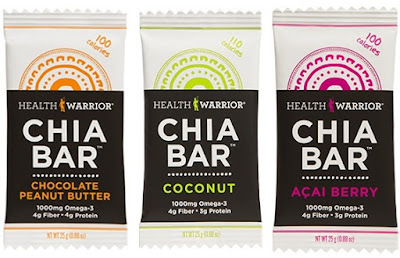 Health Warrior is the company and the brand who produces super snacks of the highest quality, Health Warrior Chia Seeds and Bars. The bars are plant based, gluten, dairy and soy-free. They are also non-GMO. Chia seeds are a fairly new product for your National Product Reviewer and we had to get accustomed to consuming this superfood, but they are a superfood. It is incredible how much of a dietary wallop these little guys pack! On their own, chia seeds have no taste. Hence, they are perfect to add to just about anything. What Health Warrior has done is to create and sell their own chia seeds and chia seed bars. The bars are 2-ounce rectangles of joy. Available flavors include acai berry, apple cinnamon, banana nut, chocolate peanut butter, coconut and coffee (our favorite). However, we understand that Health Warrior will be adding more flavors as they grow. Which ones? We don't know and they aint tellin'. What we can convey is that we will be looking for them. Health Warrior is an outstanding company, employing the wisdom of the ancient Aztecs and the Tarahumara Indians as part of their branding. It was these two groups of people who consumed chia seeds to keep them going longer and stronger.